Green roofs are sprouting in popularity around the country and are used to create healthy, ecologically responsible buildings. They improve a building’s performance and support living vegetation on a flat or pitched surface. Green roofs can extend the lifespan of a roof by protecting the waterproofing layer from weather and temperature changes. They can provide sound insulation, reduce the heating and cooling requirements and slow stormwater runoff, alleviate the urban heat island effects, capture gaseous and particulate pollutants and improve air quality. The structures can support local biodiversity, create a new open space for recreation, growing food and support the inhabitants’ physical and mental health. Green roofs have come a long way since the Viking and Middle Ages when most houses in Scandinavia had “sod roofs”. Modern green roofs have been gaining momentum across the globe since marketed on a large scale in the early seventies in Germany. Last year in France a law was passed which mandates rooftops on new buildings built in commercial zones either be partially covered in plants, or solar panels. In 2014, The City of Sydney adopted the Green Roof and Walls Policy. Under the policy, the City of Sydney will encourage installation of quality green roofs and walls by supporting, promoting, researching and monitoring green roof installation and addressing key barriers to their uptake. The first consideration when building a green roof is the weight and purpose. There are two types of green roofs. Extensive green roofs have a thin growing medium while intensive green roofs have deeper soil and are much heavier. Extensive green roofs are shallow and can provide the environmental benefits of a green roof, but cannot support regular foot traffic. Extensive green roofs have a growing medium of less than 200mm and a roof structure similar to conventional roof coverings. They weigh between 60–200kg/sqm and are relatively economical. They can support less water and root growth, so grow a limited variety of more hardy plant options. They provide some thermal and acoustic insulation benefits and are relatively easy to retrofit on existing roofs. Intensive green roofs are the big-brother of extensive green roofs. They have a larger profile of up to 1m deep, allowing them to support larger plants and have a greater water-holding capacity. They can weigh between 180-500kg/sqm or more and require a stronger physical roof structure. This makes them a more expensive option but they have a wider scope for design and use. They have greater thermal and acoustic insulation benefits but are difficult to retrofit existing buildings. Once you’ve decided on the type of green roof and ensured the engineer has allowed for the total weight of saturated soil plus all the plants, the next step is to choose the materials for each layer. A typical green roof has seven layers on top of the structural components. It starts with a waterproofing membrane, which is commonly followed by a root barrier layer, an optional layer of insulation, drainage layer, filter fabric, growing medium and finally, vegetation. In Australia, there are three major categories of waterproofing membranes: liquid applied membrane treatments, preformed sheets, including ‘single ply’ and integrated systems. Liquid applied membrane material can be made from bitumen emulsions, modified bitumen, polymer cement systems, polyurethane, polyurethane modified acrylic, acrylic or two-part polyurethane hybrid elastomers. The material is in a liquid state, is applied manually and is suitable for small roofs or roofs with a number of upstands, penetrations, corners or steep slopes. Liquid applied membranes are easy to apply, tolerant to surface imperfections, easily repaired or reapplied and are seamless. However, they are not root resistant, it is difficult to ensure uniformity of thickness, they may become brittle if exposed to sunlight and high temperatures. A preformed membrane suits larger, flat or gently sloping roofs. The majority are either asphalt-based or polymer-based and are either loose-laid or fully bonded to the substrate. They have a uniform thickness and asphalt base systems are torched down and seam welded for additional sealing and strength but are not usually trafficable, UV stable or root resistant. PVC membranes and Ethylene Propylene Diene (EPDM) and Butanoyl membranes are root resistant and Thermosetting and Thermoplastics are UV stable. Preformed membranes require a high level of skill for installation and there is the possibility condensation or moisture may soften the glue or adhesive tapes along the seams and bonding. To create an integrated system, additives are included in the concrete mix to waterproof the concrete. They are used for larger concrete structures such as landscaping over car parks or on car parking buildings. The root barrier layer protects the waterproofing membrane from damage caused by plant roots. It may not be necessary if a root-resistant waterproofing membrane is used. Typical materials used are polyethylene (plastic) sheets and polypropylene geotextile fabric. Ensure the root barrier sheet is compatible with the waterproofing membrane so no adverse reaction or chemical action occurs. Green roofs provide significant thermal insulation but since it is difficult to obtain accredited insulation values for green roof construction, it may be necessary to use conventional means of insulation to meet the BCA’s thermal insulation standards. A drainage layer carries away excess water and should strike a balance between storing water in the soil and draining storm water. Plastic drainage sheets or boards are common drainage materials for green roofs and are installed as a continuous layer. Plastic drainage layers may be rigid, open mesh structures or they may have a cup style design, enabling water to be stored at the base and used later by the plant. Cup-style drainage sheets should be overlapped to eliminate gaps between sheets while other plastic drainage types should have adjacent sheets butted together. For green roofs with high traffic, install rigid draining layers to avoid compression. Laid on top of the drainage layer is a filter fabric made of geotextile materials such as fleece or other woven materials. This layer holds the soil in place and separates the drainage layer from the growing medium, preventing the growing medium from blocking the drainage layer or stormwater system. Next up is the growing medium, which is manufactured soil, crushed brick or other inorganic material which may be supplemented with organic material such as coconut fibre or coir. Using a mixture of native soil and organic or mineral additives can help with water retention, permeability, density and erosion control. As a general guide, the growing medium should be 75-80 per cent inorganic material such as expanded slate or crushed clay and 20-25 per cent organic material such as humus and clean top soil. This will provide drainage and soil air capacity, and nutrients for the plants. The final layer is the vegetation. Extensive green roofs require low maintenance vegetation and many native plants from coastal and arid inland regions are suitable. Intensive green roof plants can be treated in a similar way to ground level gardens and require the same level of maintenance, but native plants are preferred. Plants suitable for extensive green roofs include low growing succulents and herbaceous perennials originating from dryland habitats. Annual to biennial plants can be used successfully on green roofs and tend to fall into the groups of quick growing annuals and ephemerals. Members of the Sedum family, which consists of 600 types of succulents are a safe choice. Try the native Creeping Boobialla, Creeping Myoporum (Myoporum parvifolium), Winter Apple, Amulla (Eremophila debilis), and the non-native Tasteless Stonecrop (Sedum sexanagulare). Intensive green roofs with substrate deeper than 250mm can also support small shrubs and turf. Sports turf requires a designed soil or growing medium to ensure effective drainage and regular irrigation, fertilising and mowing. Species with excessive vigour, such as Couch Grass (Cynodon dactylon) and Kikuyu (Pennisetum clandestinum), should be avoided as their rhizomes may damage waterproofing membranes. Instead opt for Nara native turf (Zoysia macrantha), St Augustine grass (Stenotaphrum secundatum and Tall Fescue (Festuca arundinacea). Vegetables require irrigation and a substrate depth of at least 200mm. Suitable small shrubs include Wattle (Acacia amblygona), Native Fuchsia (Correa reflexa) and Coastal Daisybush (Olearia axillaris). Substrate deeper than 500mm can grow shrubs up to two metres but plants with dense, upright habits should only be used where there is minimal wind exposure. Suitable shrubs include Pink Velvet-bush (Lasiopetalum behrii), Grey Honey-Myrtle (Melaleuca incana) and Westringia species and cultivars. Substrate deeper than 1m can support small trees up to five metres. Trees with sparse canopies, flexible stems and high tolerance to heat are best in areas of high wind exposure. Try the Bottle Tree (Brachychiton rupestris), Acacia stenophylla and Silver Princess (Eucalyptus caesia). The Florence Street project is a personal one for Emilio Fuscaldo, founder of Nest Architects. 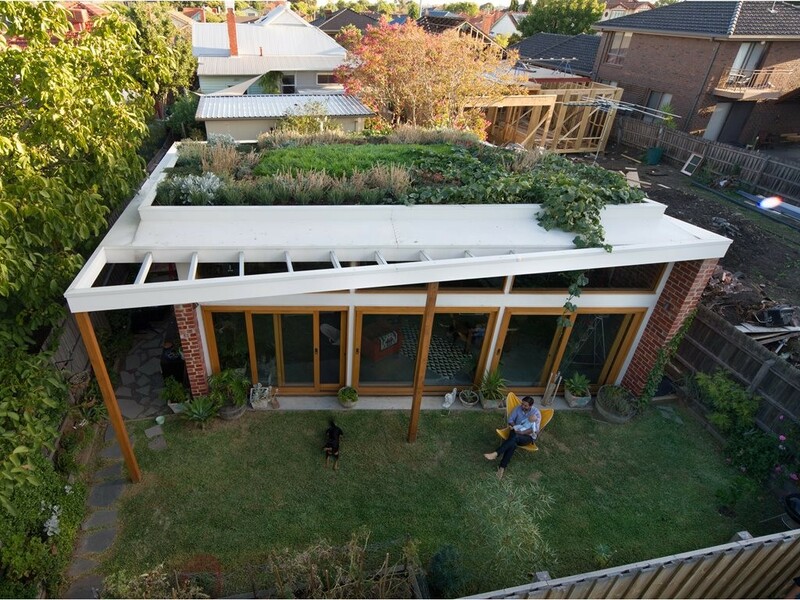 Australia’s affordability crisis prompted Emilio and his partner to purchase 180sqm of land in Coburb, Melbourne, on which they built their 80sqm ‘beach shack’ with a 50sqm green roof. The green roof provides insulation and thermal regulation, negates any need for air-conditioning during summer and reduces winter gas bills. The 200mm layer of soil reduces urban heat radiation and encourages diversity in flora and fauna. Water collected from the roof feeds into the toilet, is used on both the roof garden and the dwelling’s ground garden. The green roof came at a cost of about $30,000, but Fuscaldo says incorporating the green roof “just made sense”. Top: drainage and permeable green roof layers are essential considerations for green roof projects. If stormwater is not properly drained it will pool and create structural risks. Above: Fuscaldo says he no longer has to water his garden due to his selection of hardy plant species. Fuscaldo found the most important aspect to consider before building his green roof was the weight of the soil and the plants. “The more they grow the heavier they get and the stronger your roof structure will need to be,” he says. Florence Street grows succulents which require little to no watering. Despite a watering system being installed, after a year Fuscaldo turned off it off and the “plants are doing just fine”. In the centre of the roof is Sir Walter Buffalo, which replaced Kidney Weed (Dichondra repens) after it died off in summer. Growing successfully atop of Florence street is Lamb’s Ears (Stachys bizantina), Blue Chalk sticks (Senecio serpens), Hen & Chicken plant (Echivera glauca), Inland Pigface (Carpobrotus modestus) and Blue Flax-lily (Dianella revolute). “It really was trial and error with the planting types and luckily everything apart from the Kidney Weed has made it due to being very tolerant of the wind, sun, inconsistent rain and somewhat thin soil profile,” Fuscaldo explains. Top: concept drawing of green roof structure. Above: prefabricated concrete panels will be used to create tunnels, which will be landscaped on top. Misho + Associates are behind the design of Sydney’s new zoo set to be developed in Sydney’swest. It will be home to the first green roof habitats in Australia, which will contain animals and nocturnal animals for exhibit, support wildlife shelter and biodiversity intensification. Architect Misho Vasiljevich of Misho + Associates says the green roof was decided upon straight away due to the environmental consideration and since the location was in the middle of exhibits. The three exhibits need to provide a stable, temperature and humid controlled environment without air conditioning. They needed to allow complete darkness and controlled artificial lighting and cut out unnecessary noise from material movement. This will be achieved using prefabricated concrete panels to create tunnels, which will be landscaped on top. Misho has chosen Humes Concrete road culverts, along with salvaged wood from Tasmania for external cladding. The design will also incorporate Xlam Cross Laminated Timber. Green roofs can beautify and dramatically increase the sustainability of a design. Despite an initial cost, the insulative properties of a green roof will pay itself off in savings from energy bills. Nest Architects advises those looking into green roofs to select plants which grow, and cover up exposed dirt quickly and ensure the waterproof membrane and drainage cells are UV tolerant and perform well over the long term. Incorporating a green room will allow for healthier buildings and healthier inhabitants.